The murky gleam of a full moon reflected off the greenhouse’s polycarbonate glazing as Jaide crept across the circle of bare earth surrounding the dark building. Ahead of her, Trevor’s shadow halted with a hand up. After a pause, he dropped to his belly against the icy ground. She mimicked the action, her heavy daypack slamming against her spine. Her heartbeat rattled against her ribs. The brim of the baseball cap she wore to hide her face from cameras blocked her view of the greenhouse, so all she could see was the gated lane. To her right, Cindy panted like she’d just sprinted a mile, gulping and gasping for breath. An engine rumbled near the greenhouse. Headlights winked on, casting shadows across the rocky soil. She pressed her cheek flat against the frigid dirt and held her breath, willing herself to be one with the Earth. The car backed up then proceeded down the lane toward Lafayette. Jaide exhaled a foggy sigh. Once the sound of the engine had faded, Trevor rose and began his skulk toward the greenhouse again. Jaide scrambled to her feet, fingers and toes numb from lying prone against the January soil. The one-gallon can of gasoline in her pack seemed to weigh fifty pounds, but the real powerhouse for tonight lay against her thigh in the pocket of her jeans—a flash drive loaded with Trevor’s computer virus. She reached the side of the building right behind Trevor, core trembling with cold. He pulled his cordless Dremel out of his pocket. A high pitched whine filled the air as he started to cut through the polycarbonate wall. After only a minute, he pulled a section of panel free and ducked inside. Jaide crawled in next. Humid air, thick with the scent of soil and greenery, buffeted her face with warmth. The low drone of the circulation fans vibrated in her ears, and potted plants made shaggy shadows in the moonlight. “Do you think any of these plants are dangerous?” asked Cindy, holding back against the wall. Cindy nodded, and Jaide let go. They went their separate ways. Flashlights would be too easily spotted from outside since the walls were made of glass, and Jaide slid her feet along the concrete floor to feel the way, not touching the stainless steel tables or the Frankenstein plants on either side. Corporations like TelomerGen claimed they were using genetic modification to end world hunger. In reality, they were adding to it by taking away self-sufficiency; farmers weren’t allowed to save their own seeds, or even worse, the modified seed would be sterile. Corporations wanted to put a patent on life. If she could, she’d torch this entire facility. But she’d only brought enough gas to damage the computers and other hardware. The fire was to be a decoy anyway; the real damage would be done by the virus, corrupting the research so TelomerGen couldn’t repeat this particular atrocity any time soon. Hopefully the infection would make it all the way to their back-up servers before IT discovered it. Once the climate controls were out of commission, nature would take care of the plants themselves. She reached the end of the row and squinted toward the far wall. Two doors led presumably to the offices, lab, and staff rooms. On her right, Trevor’s feet scuffed against the paved floor. She tried the door on her left. Dropping to a squat, she fished in her pocket for the tiny flashlight she’d brought for just this event. The bulb was red, so less likely to be noticed by someone observing the facility. Standard doorknob, no deadlock. She retrieved her tension wrench, inserted it and the rake, then jiggled until she heard the pins drop. Twisting the handle, she pushed. The door swished open. A scent like wet pennies greeted her as she slipped inside. From large pots on the concrete, foliage reached toward the ceiling in graceful arches. Taking a chance, she shone her light upwards, curious. Atop the high stalks hung bags covering seed pods or flowers—she wasn’t sure which. They reminded her of heads held upright in a hangman’s noose. A shiver raced down her spine. Amaranth, one of her go-to protein sources. These were freakishly tall from whatever DNA the scientists had inserted. The need to eradicate these Frankenstein plants burned through her veins. Not yet. These amaranth were only prototypes. The project could be easily repeated unless she destroyed the data. Then she would come back and torch the specimens. Moving carefully between the leaves, she looked for another door. Sweat rolled down her back beneath her hoody in the muggy heat. At the back wall, she found two office doors. She turned the knob on the one to the right, pleased when it swung open; doubly pleased at the whir of a running computer. A wiggle of the mouse woke the screen, showing the progress of a data process. Good; she wouldn’t have to hack in to upload the virus. With a few keystrokes, she aborted the program and inserted the flash drive, overriding the protocols the way Trevor had taught her. The machine hummed again as it accepted the new code. She clenched her teeth. Dammit, of course there was an alarm on the climate controls. She would’ve thought of that if Trevor had given her a chance to plan. But they’d been out of time; tomorrow, the Coalition would be announcing a call to protest, and once that happened, the company would increase security or move the tests to a new facility. The corporation couldn’t be allowed to keep their data. Only twenty more seconds to complete the upload. She drummed her gloved fingers on the desktop. She couldn’t leave the flash drive behind as evidence. Ten seconds. Another, much louder alarm joined the first; a burglar alarm. Someone must’ve opened the main door. The computer screen flashed once, telling her the transfer was complete. She yanked the drive free and dashed back the way she’d come. Careening through the room with the towering plants, she underestimated a turn and the weight of the gas can in her pack threw her off balance. She slammed into the high stalks, toppling several over. The flash drive flew from her gloved grip amidst a volley of falling leaves. She regained her balance, heart in her throat. If she stayed to search in the dark, she’d be caught for sure. On trembling legs, she bolted for the door. Her feet tangled on a fallen stalk and she fell, landing on her outstretched palms. Fallen leaves and crushed paper bags rustled against her face as she scrambled upright and kept going. Jaide shook her head, breathing too hard to reply. Cold air blasted the sweat from her face as she burst out into the moonlight. Ahead, Trevor’s form scrambled over the top of the six-foot chain link fence. In a few more steps, she hit the cold metal and dug her toes into the gaps to hoist herself up and over, Cindy right beside her. They caught up to Trevor as he crossed the dirt road, and together they ducked into a windbreak along the neighboring field. “That was close,” Trevor whispered. Frozen branches crackled underfoot as they crept along in the dark. At least there was no snow to leave tracks. They’d parked nearly a mile away, and had planned their escape via Google Earth. This line of trees would lead them straight to their car on the other side. Jaide had to scramble to keep up with Trevor’s long strides. “I didn’t have time to hack in,” said Trevor. “And destroy my computer and everything on it,” Trevor added over his shoulder. “The FBI can hash the ID from every file on the drive and trace it back to the source. Thanks a lot.” His anger radiated like heat through the darkness. “You’re the one who insisted we had to take the risk,” said Jaide. Trevor blew out a sharp breath and picked up his pace, leaving her and Cindy behind. Jaide clutched Cindy tighter and stumbled through the darkness. 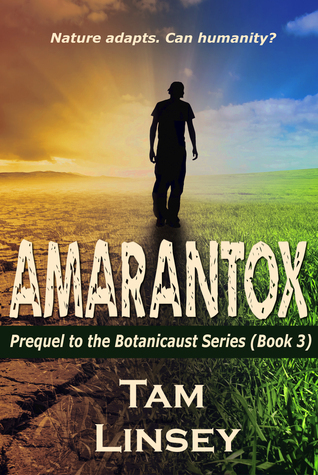 Look for Amarantox at online retailers spring of 2015! © Tam Linsey, 2015. All rights reserved.